Timestamp under the Date and Other Hacks. ~ The Blog Doctor. 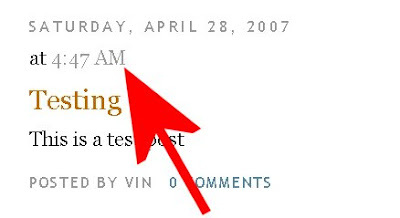 You are here: Home > Blogger Hacks > Timestamp under the Date and Other Hacks. Timestamp under the Date and Other Hacks. Login to Dashboard and click on Layout. This will bring up the Page Elements subtab under the Template tab. First backup the template by clicking on the Download Full Template link. Thus if anything goes wrong you can upload this copy of the backup. 1. Add Icon To Post Titles. 2. Many Headers In One Blog. 3. How to Remove Blog Title. 4. Table of Contents Template. 5. Add Header to Dots Template. 6. Clickable Headers For New Blogger. 8. EMail Link Graphic Below Your Posts. 9. Stumble Upon Bookmark Icons Below Posts. 10. Language Translation Flags in Two Mouse Clicks. 11. Fixed Headers for Blogger. 12. Add Third Column to Blog. 13. Customize the Post Footer. 14. Clickable Image Maps for Blogs. 15. How to Link to Related Articles. 16. Write a Book in Your Blog. 17. Table of Contents in Posts Column. 18. Add Recent Posts List after Every Post. 19. Make Clickable links on Other Blogs. I have spent a week trying to Format Post Footer – with no success. I am using Erudite Template. 4. To close the line space (leading) between the Post … Link line and the Label/Category line. Having trouble.. to make the Footer Font Smaller, and reduce the Footer Line Spacing… and think it would be a Great Hack. I have spoken to others who have had trouble with these design issues, also. Please consider these design issues for Hacks addressed on your site (which is incredibly comprehensive!) … and give me a clue, if you may, on how to do it.